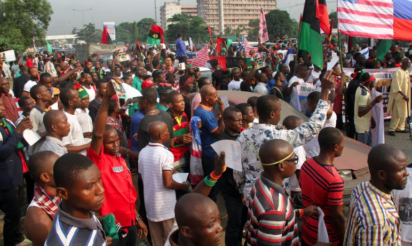 At least five members of the Indigenous People of Biafra, IPOB, have been allegedly shot dead in Asaba Delta State‎. In a statement sent to DAILY POST on Sunday, IPOB spokesman, Emma Powerful claimed that military men stormed a gathering of the pro-Biafra group and shot members on target. Another Nigerian army massacre going on now at IPOB family meeting at Okwe primary school Oshimili south LGA Asaba Delta state. The Indigenous People of Biafra, IPOB, and its leadership worldwide condemn condemn the attack on our members at Asaba in DELTA state. Hausa Fulani people living near the primary school called their Islamic brothers in the Nigerian Army who came and opened fire on another IPOB peaceful assembly yet again. ‎However, when contacted by our correspondent, the Delta State Police Spokesman, DSP, Andrew Aniamaka said he was not yet aware of the incident. He promised to investigate and get back.